One great byproduct of Frisco’s rapid growth over the past decade-plus is the accompanying uptick in the number of great restaurants here. And for those who love chicken, there’s a virtual plethora of viable options just a short drive away. Whether you prefer it roasted, fried, grilled, shredded or accompanied by some waffles, here’s a look at where to find some great bird here in Frisco. This bustling breakfast and lunch spot is at Lebanon Rd and FM423 and judging from the crowd on a recent Friday morning, it’s a clear winner. Their chicken and waffles are $11, but trust me, they’re more than worth it. Not only do you get a full Belgian waffle, which is cut into quarters, but there is a more than healthy portion of breaded chicken, which has been diced and sprinkled across the top of this light and fluffy waffle. Some dusted powdered sugar only makes this amazing dish even more delicious. But beware, this dish is so filling you might need to have a second cup of joe to let your food settle or get your dining companion to help you to the car. Ask anyone who’s lived in the Metroplex where to get the area’s best fried chicken and they just might tell you that Babe’s, which has been serving up its outstanding home cooking for some time near Frisco Square, is as good as it gets. Their fried bird is served family style for those who dine in and is accompanied with everything from salad to mashed potatoes, creamed corn, and green beans. Oh, and let’s don’t forget about their outstanding biscuits. Babe’s also serves up fried chicken to go for those who don’t have time to sit a spell in their Frisco outpost. This is comfort food personified and a good reason to take a brief sabbatical from healthy eating. When Tupelo found it’s way to North Texas at The Star in Frisco, it was referred to as “gracious food with southern roots.” Their Sweet Tea Roasted Chicken is impressive not only for its size but its flavors. At $18, this dish is the most expensive in this story, but considering the amount of chicken you get, a half bird consisting of a leg, breast and a thigh, and the incredible amount of flavor, the price tag is more than well worth it. Their Sweet Tea Roasted Chicken comes with two sides, one of which must be their Cast Iron Mac and Cheese, a perfect plate of the greatest of comfort foods which come topped with some nicely toasted breadcrumbs. I opted for the Mixed Greens Salad for my other side, which featured a great vinaigrette made with balsamic vinegar. Super Chix now has two Frisco locations and for a place that proclaims itself the purveyor of the Last Great Chicken Sandwich, this popular spot delivers in a big way. The Nashville Hot Chicken Sandwich deserves a spotlight, as it’s a perfectly breaded and fried piece of chicken swimming in their Nashville hot chicken sauce. An extra side of this spicy concoction comes on the side for dipping of their fresh-cut fries. Yes, this sandwich and the accompanying sauce are spicy, but it’s a good burn for those who love hot food. And if hot isn’t your thing, Super Chix has five other breaded sandwiches, including a Cordon Bleu, so there are other options. You may also enjoy Super Chix’ Blackened Cajun, which comes with garlic aioli, lettuce, tomato and fried pickles; and the That’s My Bacon Jam, which of course features bacon jam, Gouda, lettuce and tomato. If you’re craving Buffalo wings and tacos, Crush Taco’s Buffalo Chicken Taco is a popular offering that will likely satisfy both cravings. This stuffed taco features great chicken in Buffalo sauce, but the accompanying crumbled blue cheese, diced celery, carrot and mild ranch crema helps bring all these flavors together nicely. Sure, this taco is $4.50, but after you eat one, you won’t think twice about handing the money over for another. They are that good. Diners can also choose whether they want this tasty dish on a corn or a flour tortilla. This popular spot near Toyota Stadium is bringing a dose of southern hospitality to the fast, casual setting. They serve up breaded chicken, namely tenders and wings, and plenty of it. And their tenders are about as good as they get here in Frisco, nicely breaded with great flavor. Plus, Slim Chickens also has six different dipping sauces and serves side items like coleslaw and macaroni and cheese. They also have chicken and waffles, sandwiches and wraps. The Rover has plenty of great appetizers on their menu, like their renowned Rover Nuts and Irish Egg Rolls, but their House Chicken Wings are a must-try. This order of eight wings, which features both drums and flappers, offers plenty of meat for a reasonable $9. The Rover’s wings also come in either BBQ or Buffalo sauces. I chose the latter and it was the right call, a nice order of tasty wings with a spicy but not fiery sauce. Oh, and The Rover’s wings also come with carrots, celery, and dressing, accompaniments which often cost extra at other local wing joints. 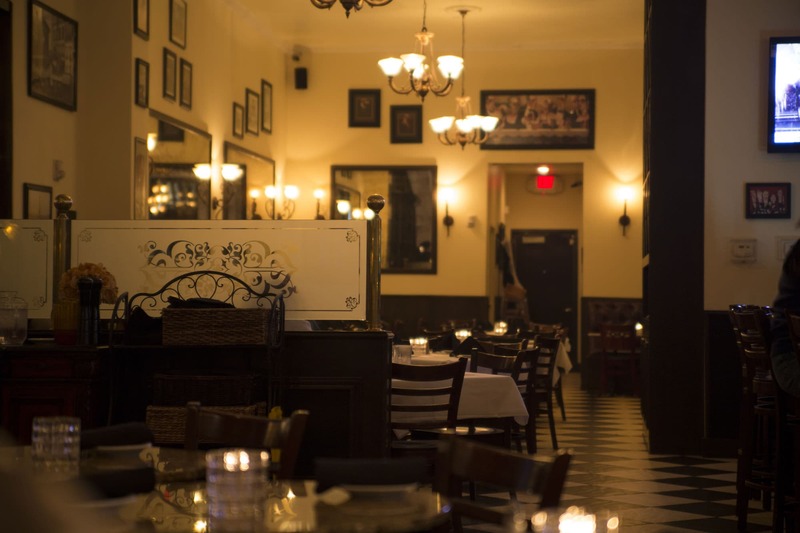 There are a number of reasons to step into the relaxed sophistication of Frisco’s favorite neighborhood bistro. Here you can dine on hearty fare rooted in classic French technique. But if lighter fare is what you crave, the Paradise Salad is a great way to have your greens, and chicken too. The salad features a grilled breast of chicken, fresh strawberries, mandarin oranges, cucumber, chopped pecans, shredded coconut, garlic croutons, and coconut mango dressing. Enjoy it by the fireplace on their beautiful patio and finish it with one of their made from scratch baked goods. Who did we miss? Leave us a comment below with your favorite chicken dish in Frisco!